Jon Brion (a talented multi-instrumentalist music composer/producer), was one of my clients from September 2000 to March 2003. 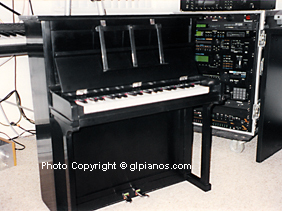 His assistant back in 2000 (Tom Biller), originally contacted me saying that Jon bought a ‘Mini Piano’ and recently had the casework refinished. The piano was dismantled so Tom asked me if I could put the keys back in & reassemble it (usually this is an easy job). He said that Jon was about to go on the road with Beck as part of the Neil Young tour and could I reassemble the piano by the following morning. I ended up pulling an all-nighter to get the job done (7 ½ hours according to my records). The piano was delivered to my home along with the keys and boxes of loose parts. 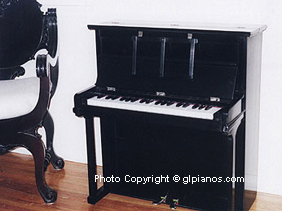 The Action (mechanism) needed major regulation and repairs, the keys needed to be leveled, and the piano needed tuning many times (it was at least a tone below A440 Concert Pitch). I don’t think Jon or Tom realized the extent of the work I had to put into the ‘Mini Piano’ to get it working again (especially in one night). After that I was called to do several pianos for Jon Brion (C/O record producer Tony Berg, Virgin Records), in Jan 2001. By coincidence in August 2010, I met with Tony again when he and recording artist Oren Lavie visited my piano warehouse and rented a Yamaha U3 to record Oren’s latest album at ‘Zeitgeist’ Studio. Since that time I have worked on other pianos for Tony as well as renting him pianos for different projects. and pitch raised it to A440 Concert Pitch. From 2002 to 2003 I worked on Jon Brion’s ‘Mini Piano’ many times as well as an old upright, both at ‘The Paramour” in Silverlake, CA. As well as tuning the ‘Mini Piano’, this time I put small brackets under the keybed to try to reinforce the structure of the piano as it was getting in bad shape from being moved around. I also customized some bass strings for it since several were now broken and you could not buy them (one bass string looped around onto the next note) - very unusual. Jon at that time gave me a copy of his new CD ‘Meaningless’ (an excellent and very creative album). ‘The Paramour’ (now owned & named by Dana Hollister), is an historic old mansion in Silver Lake where rock bands can stay and record albums. The TV shows ‘Rock Star: INXS’ and ‘Rock Star: Supernova’ were also filmed there. By coincidence I used to work on pianos at ‘The Paramour’ when it was previously owned by the ‘Franciscan Sisters of the Immaculate Conception’ and just recently (2012), sold a Baby Grand to the TV show 'Californication' where 'The Paramour' is used for one of the featured sets along with the Baby Grand. Through the years I’ve worked on other Mini Pianos and even sold a few to film composers (such as Mike Andrews, Brad Breeck), but Jon Brion’s ‘Mini Piano’ was definitely the smallest one to date. It is only 32” tall by 28” wide with 40 notes (just over 3 octaves), and it has 1 string per note. Upon arriving at the ‘The Paramour’ to work on the ‘Mini Piano’ again, Jon had now put tacks in all of the hammer heads which was not the best for the hammers but it did create some unusual tones (similar to a Jangle Rail on an old upright player piano). after I completed the restoration work. compared to the antique chair.